All Gift Card Orders will be shipped via USPS within 3 business days of order completion, unless an alternate expediated shipping is selected at check out. Gift Cards are non-transferable, non-refundable and are not redeemable for cash except as required by law. Treat gift cards as if they were cash. 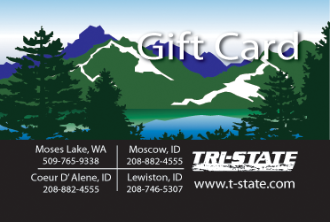 Sportsman & Ski Haus will make all efforts to replace lost or stolen gift cards, but do not guarantee replacement. Copyright © 2011-2019 Tri-State. All rights reserved.